atene KOM‘s series of publications, “Transport and Environment”, offers a broad spectrum of content and interdisciplinarity in the fields of transport and the environment. It publishes in-depth articles on traffic-related pollution and its consequences, but also on current challenges and trends with regard to environmentally friendly alternative propulsion systems. The series serves the exchange of knowledge and the accompaniment of current discourses. The articles of the series appear at irregular intervals several times a year and can be downloaded free of charge as PDF files from this page. 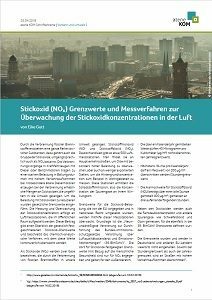 The articles are available in German only. The combustion of fossil fuels produces a whole range of toxic substances, including the group of nitrogen oxides, colloquially known as NOx. Older diesel engines in particular produce considerable amounts of nitrogen oxides during combustion, which are released unfiltered into the environment. Legal limit values have been introduced in order to reduce the exposure to nitrogen oxides. The nitrogen oxide concentration is measured and monitored at air monitoring stations installed in public spaces. This article provides an overview of the legally stipulated nitrogen oxide limit values and describes the chemical-analytical procedure with which these values are continuously monitored. Nitrogen oxides play the main role in the current debate on the pollution caused by diesel vehicles. Nitrogen oxides, i.e. the oxygen compounds of nitrogen – often referred to as NOx – cause health and environmental hazards. Nitrogen dioxide (NO2) in particular is held responsible for respiratory diseases and is regarded as one of the causes of increased ozone concentrations in summer (photochemical smog). 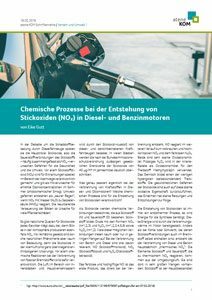 The first article in the series deals with the formation of nitrogen oxides by diesel and gasoline engines and shows the chemical processes that are responsible for the high nitrogen oxide emissions from combustion engines.